2017-18 Player Review: Dale Weise, what is it you say you do here? 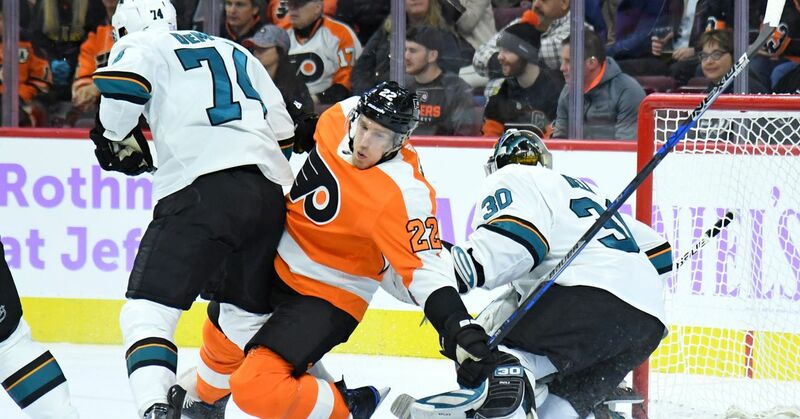 If you thought Dale Weise was underwhelming in his first year with the Flyers last season after signing a four-year contract in free agency, the bar might have been set too high. Weise was often a healthy scratch for coach Dave Hakstol in 2017-18, playing in just 46 games on the season with most of them coming at the start of the season before watching his lineup spot given away to the likes of Matt Read, Taylor Leier, Jordan Weal, and Oskar Lindblom, among others. When the veteran was in the lineup, the results weren’t pretty. Weise added four goals and four assists for eight points while averaging just 10:34 of ice time per game. It’s particularly alarming that fellow veterans with similarly terrible results, like Jori Lehtera and Valtteri Filppula, were given far longer leashes from Hakstol than Weise. Playing for a coach that often looked the other way when it came to the play and results of his older players, Weise couldn’t even take advantage to stay in the lineup on a regular basis. Though Weise hasn’t historically been a point producer, he did post a couple decent seasons from 2014-16 that essentially landed him the contract that Flyers GM Ron Hextall dished out. Weise had 29 points (10G, 19A) in 2014-15 and 27 points (14G, 13A) in 2015-16 before signing with the Flyers on a four-year deal. Since then, he’s produced just 12 goals and 11 assists for 23 points in 110 games over two seasons for the Flyers. Though Hextall knew he wasn’t getting a 30-plus point player, he probably expected Weise to produce double-digit goals playing in the bottom six, but that obviously hasn’t been the case — at least so far. As I touched on earlier. the numbers didn’t look great for Weise in year two, and it’s possible that he looked even worse on the ice that the numbers suggested. In his defense, Weise did spend a ton of time saddled with both Lehtera and Filppula, which isn’t going to help anyone. The veteran was much better playing on a line with Weal, whose skill and ability to create led to better metrics for Weise than almost anyone else in the bottom six. A quick look at his metrics indicate that, yes, Dale Weise was easily one of the Flyers’ worst skaters a year ago. He lagged far behind his teammates in puck possession with his -5.09 Corsi Relative to back up what we saw during the season as a player that got lost in the shuffle and was always on the wrong side of puck battles and chances. Not only was Weise one of the least productive Flyers on the ice this season, but he did so while starting 55% of his shifts in the offensive zone. Weise and his linemates were often put in a greater position to succeed while also sheltering them from tough defensive minutes and he was neither effective offensively nor passible defensively. 1. Did this player live up to our expectations for this season? In short: no. Dale Weise sticks out as one of the lone gaffes since Ron Hextall took over as general manager four years ago. Signed to bring consistency to the Flyers’ bottom six, Weise hasn’t provided even close to what he brought to the table in Montreal that landed him the free agent deal from Hextall two summers ago. The Flyers dearly needed more production from their bottom six this season to help support the heroics of Claude Giroux, Sean Couturier, and Jake Voracek up front, but Weise and Co. were unable to provide much help at all and Weise was a big part of that failure. 2. What do we expect from this player next season? We probably shouldn’t expect too much from Weise given what we’ve seen the past two seasons, but perhaps new line combinations in the bottom six and some fresh young legs could help spark the veteran — if he’s in the lineup that is. Weal proved to be a solid linemate for Weise as he posted a respectable 52% Corsi For while on the ice with Weal a season ago. Nobody is saying to slap Weise on the top line here, but perhaps giving him some better linemates could help him turn it around and finally fall into the bottom sixer the Flyers thought they were getting. But mostly, we’re expecting Weise to serve a bunch of time in the press box again, which isn’t the worst thing given how bad he’s been since signing here. 3. What would we like to see this player improve on? In Montreal, Weise did all the little things well in the bottom six and could be counted on to forecheck, hit, be responsible defensively, and provide occasional offense. In Philadelphia, he’s been nearly invisible. He needs to be hungrier on the puck and stronger on his blades and stick in order to make an impact on the lineup. Given that young players are starting to break through to the NHL roster, Weise will need a strong camp to prove that he’s worthy of a roster spot.